In our endless quest to offer our customers the latest cutting edge designs, we often look at our current products that have been on the market for a few years and begin an evaluation process to see where we can improve them in performance, durability, aesthetics and ease of assembly. We look to our own experience with the airframe over several years as well as to customer feedback for valuable information to help us improve our designs. Our award winning 58 inch Extra 300 was released several years ago and was received with great enthusiasm by the modeling community at large. Since then there have been numerous advances not only in airframe design and materials used, but also in power systems and battery technology. The availability of high quality 5S and 6S batteries at very affordable prices (some as low as $28!) forced us to re-examine this size aircraft. The result is a new line of 60 inch aircraft, the first of which is the brand new 60 inch Edge 540T EXP. The Edge features many of the construction techniques and technology incorporated into our hugely successful 48 inch EXP line. Rather than using carbon fiber and G10 composites as a way to dress up our aircraft and coming up with some kind of flashy name to use as a marketing gimmick, we actually use carbon fiber to add strength to the airframe at points that can greatly benefit from this material. Carbon fiber longerons add strength and rigidity to the fuselage while allowing it to be handled and transported without fear of breaking it. G10 composite sheets are used to reinforce the landing gear plate and supporting structure creating one of the toughest and most durable landing gear mounting systems in the business. Airfoiled carbon fiber landing gear, tail wheel assembly, and wing tube provide strength and durability at a great savings in weight. Of course the Edge features the intricate interlocking laser-cut construction pioneered by Extreme Flight almost a decade ago. 2 gorgeous high visibility Ultracote color schemes are available and feature matching showroom quality painted fiberglass cowls and wheel pants. A protective wing bag set is included as well as a decal set. The level of pre-fabrication is amazing and will allow you to get your Edge flying in a few short hours of easy assembly. 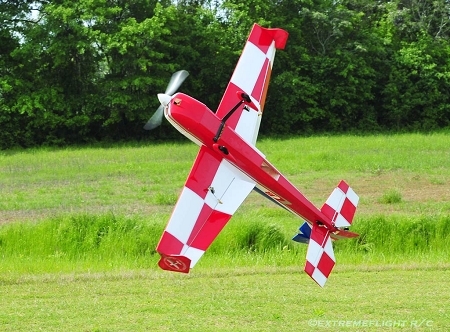 The flying characteristics of the Edge must be experienced to be fully appreciated. There is simply no other aircraft that is any more stable in high alpha flight than the 60 inch Edge. If you are looking for an airframe to help you master the Harrier maneuver, then look no further, it simply doesn't get any easier. The Edge inspires confidence when you are down low and slow and won't bite you if you get a little sloppy with your inputs. It has enough mass to maintain inertia for a super fast roll rate and insane gyroscopic tumbling maneuvers, yet is light enough to float like a feather on landings. There are companies out there that would have you believe that low weight is the "be all end all" characteristic of a great 3D aircraft. This simply is not true. 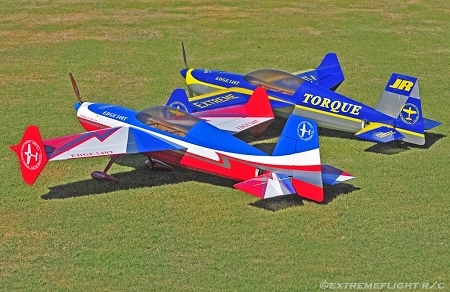 While a relatively light weight airframe is important, we must remember that we are flying aerobatic aircraft, not box kites. The 5-6 pound weight of the Edge has been perfectly matched to the aircraft's size and power system allowing it to be docile and "floaty" when required and fast and aggressive when desired. The performance envelope of the Edge is simply astounding. 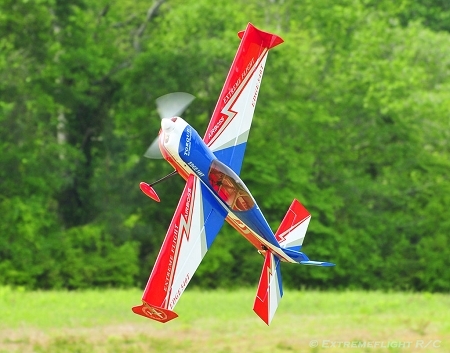 We are offering the recommended Torque 4016T/500 and Airboss Elite 80 Amp ESC which this aircraft was built around as a combo with the Edge for a substantial savings. 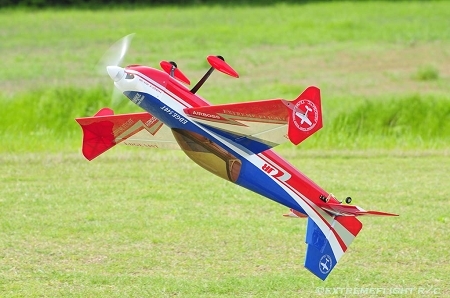 Whether you are an experienced 3D flyer or a newbie looking to get your feet wet in this exciting form of flying, you owe it to yourself to check out the 60 inch Edge 540T EXP from Extreme Flight RC.